Praying for guidance as I program my mind for victory, not defeat. Dear Almighty Father thanks for blessing me ,I trust in the word and I receive all the prayer. Blessed is your holy name Father I give God the glory . I thank you for You always blessed me with what is the best for me. Thank You Father,for Your abundant blessing and answered my prayer. I know that through my Lord Jesus Christ. I will overcome every situation in my life. My mind is programmed for victory.I will not be defeated. Every situation I face today. I give it all to You,dear God. May You give me a way out and bring me closer to You. Thank You Lord Jesus,for always working for my good,and for being with me. I desperately need GOD to HELP me end this nightmare I’ve been living with for over 6 1/2 years. Child custody nightmare that has drained me in ALL levels. I’m trying to understand why EX continues to be untruthful, neglectful, and with little concern for our daughter and gets away with it. He portrays to be someone he is not in court and they believe him. It’s truly heartbreaking and very discouraging to see how this man is getting away with lies with his high profile attorney. Sadly, my little girl is paying the price. PLEASE PRAY FOR US for JUSTICE and FAVOR over us. God knows the exact story and my unconditional love and concern for my little one. Need PEACE, VINDICATION, FAVOR, and JUSTICE!!!!!!!! Oh, my heavenly Father, I thank you cause I’m blessed. I know this since I was born. Every single day of my life is special because of the blood of Jesus. l want to be better than now and to be a blessing for those who need you, in Jesus name I pray, Amen. Lord, I know you are holding my future and give me strength to believe in you fully. I believe my life will be blessed by you in every circumstances. I thank You to give me the strength and the fulness of God’s Peace in my daily life. I will walk in faith,to walk closer in Your way and in complete obedience to You. I know that through my Lord Jesus Christ.I can program my mind for Victory. Dear God,I ask that today. Please shine through me Your light,so that every person I meet may feel Your presence. I thank You for Your abundant blessings,and answered my prayer. I thank you dear Lord for this new day. Please help me so that I can have a bless day. Amen. I praise You my dear Father in Heaven.I thank you for this new day,for I still can see the Sun comes up in the morning. Dear God,I ask You today,Please help me to walk closer in Your way.I will walk in faith and in complete obedience to You. Shine through me so that every person I meet may feel Your presence in my soul. Thank you Lord,to give me the strength and the Fulness of God’s Peace in my daily life. I give You thanks dear Father God,for every morning bring me God’s word to strengthen my day. So today I am blessed and Victorious in Christ Jesus. I walk in faith and complete obedience to You. 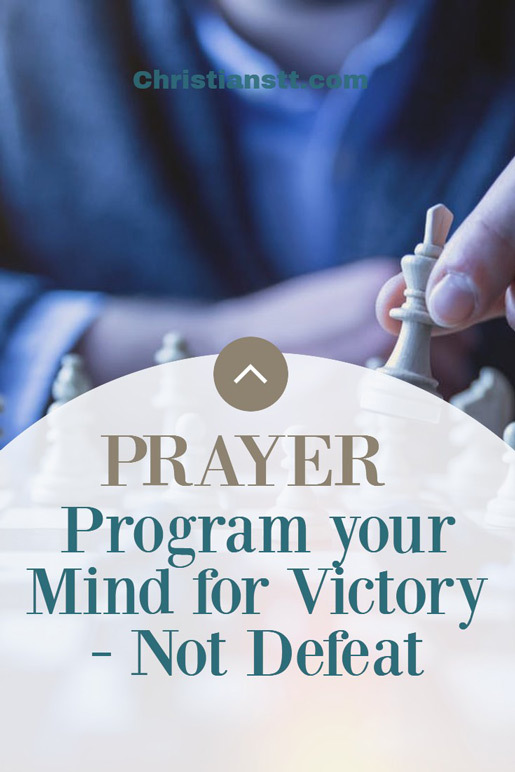 I pray that today I program my mind for victory not defeat,in the name of Jesus. Thank you Lord,for give me the strength and the Fulness of God’s peace in my daily life. Thank u for encouraging words today, reminding me that I am victorious in Christ Jesus! I am nothing without u Father God, praying that u will give back the joy that comes from u , renew a right spirit within me! In the mighty name of Jesus, healed with your blood. I praise You dear Heavenly Father,for You are awesome. Dear Lord,help me when I falter,to walk in complete obedience to You. And when my earthly walk becomes difficult.In Jesus name I pray for Your guidance as I program my mind for Victory,not defeat. Thank you for the Holy Spirit will restore and revive me completely. Thank you Lord,for Your favor and Your grace. I thank you to my dear Heavenly Father,for the price Jesus paid for me.And thank you Lord Jesus,as I program my mind for victory. Dear Father,my hope,joy,peace,strength and confidence comes from You.And I claim my healing,restoration and redemption. Thanks so much for this powerful prayer. May the good God continue to cover us with wings of protection and blood of Jesus. Wanna thank you for these prayers of encouragement. I often find myself lost and defeated but when I pray and read these prayers I feel so much better. Please pray for me and my family going through alot right now. I ask for prayers for a legal situation to turn out ok for my daughter and may she finds her comfort in God. May He wrap His gentle hands upon her and guide her. Praying for God’s mercy and for a financial breakthrough . Trying to save my home yet again but I know I serve an awesome God. He is an on time God. I just continue to praise and glorify His wonderful name. Thank for this prayer & also for other prayers. I often feel very scare of what will happen . So fear take over in my mind than i cant sleep. So this prayer is very useful for me. I am a winner , i have the victory , Thank You Jesus???????? Thank you so much for the prayers and the Bible scriptures they have been very helpful. May the Good Lord richly bless you. Thank you Aboth. May God richly and generously bless you! Thank you so much for this wonderful supplication Bevjoy. You’re welcome Yvonne! You are blessed! Amen may God Bless You .All praises to God. Peace Be Still, Thy will ne come. May God’s favour and grace go with you always! In Jesus name! May God bless you also! That was a relevant prayer for me. Being a falling kind of person from faith with circumstances, this gives me strength to believe irrespective of the prevailing situation and there by strengthen others in faith. Thank You very much Bevjoy for your prayers. You are welcome! God’s continued blessing to you! 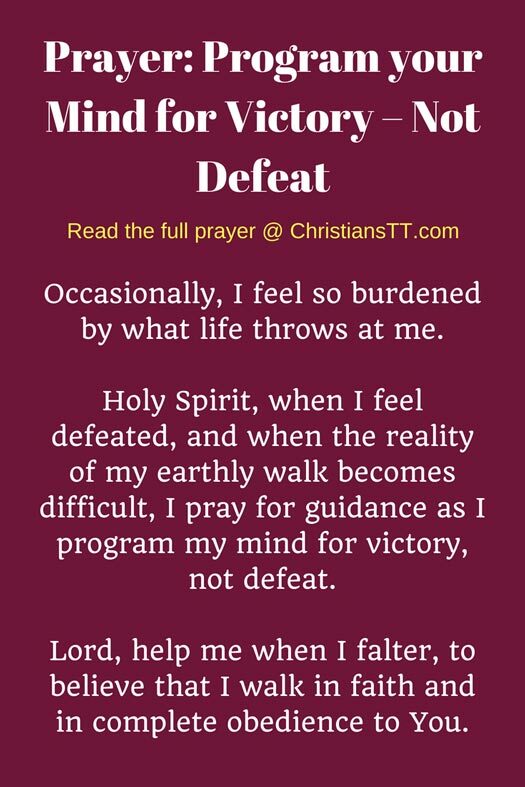 I feel very blessed reading your victory prayer! Praise God. I shared this with my prayer team as well. God bless you! Bevjoy very very relevant and important prayer in life, to programme ourselves with positivity to be able to soar like an eagle with the Lord. God bless you more in all your endeavours in Him. You’re welcome Geevetha. Thank you for your encouragement. Have a wonderful weekend! Thank you for this prayer.. I needed this… I felt as though my life has no meaning and I was kind of lost and depressed as to why am I living.. This prayer encourages me to live life with a positive note.. Thank you.. God bless you..
You’re welcome Manju. Really appreciate knowing that I’m able to reach out and touch your life by the power of the Holy Spirit. Have a blessed day and weekend.